The Winton automobile certainly caught the public imagination—first when it was introduced in the Gilded Age (late 1890s), again when it was featured on a 1995 U.S. postage stamp, and yet again when, in 2003, PBS aired "Horatio's Drive" about a doctor, his chauffeur, and his faithful dog Bud who made the trek cross country, from San Francisco to New York, in their trusty Winton. Only 19 when he arrived in the U.S., Scottish immigrant Alexander Winton got work as an engineer on a steamship, then hired on at the Delameter Iron Works in New York and, later, at a marine engine shop. In 1884, he made his way to Cleveland, Ohio, where his sister lived and where he found work as a superintendent in an iron factory. Then, in 1891, with some help from his brother-in-law Thomas W. Henderson, he opened the Winton Bicycle Co. where he manufactured bicycles according to a design he had patented. While that enterprise flourished, it wasn't long before the motor carriage bug bit him hard, just the way it had bitten other early bicycle manufacturers. Winton built his first single-cylinder automobile in 1896, exhibiting it to Cleveland newspapermen that October. The following year he built a second 10 hp two-cylinder car, and, along with partners Thomas W. Henderson (Vice President) and George H. Brown (Secretary), he incorporated The Winton Motor Carriage Co., capitalized by 2,000 shares selling at $100 per share. A crew of sixteen dedicated workers assembled the early motor cars in a portion of a factory owned by the Brush Electric Company. There were machinists, woodworkers, a blacksmith, painter, tinner, trimmer, and all-round helpers working on Winton's invention, one he developed through an understanding of how bicycles worked and at-home experiments with a gasoline engine. Acknowledging the power of the press and describing his first car, a dos-a-dos (back-to-back seats) in a November 1896 article in The Horseless Age, Winton detailed that the car weighed less than 400 pounds, had wooden rims and pneumatic tires (he'd convinced Benjamin franklin Goodrich to develop tires for cars that were strong enough to handle higher speeds and heavier loads), a five-gallon tank, an engine with all working parts immersed in oil, and could achieve a speed of 30 mph. Authoring another piece in the May 1897 magazine The Horseless Age, Winton wrote about his second, new and improved car with 2-cylinder vertical engine that rolled out of the shop just two months after the company's founding. A 60-mile road test from Cleveland to Elyria, driven at an average speed of 12 mph, proved—to Winton's satisfaction, at least—that the car was every bit as good as a horse and wagon. There were smaller wheels in the front (30" diameter) than in the rear (36" diameter) with nickel-plated spokes, steel rims, and three-inch pneumatic tires. The use of ball bearings ensured that parts wouldn't wear away from friction. While the weight had surged to 1800 pounds and the tank now held seven gallons, the body, resting on "easy-riding" springs, came in polished natural wood with nickel trim and leather seat cushions and could be ordered with a canopy top. Answering the consistent complaint that early cars were noisy and smelly, Winton claimed his engine was "compact, practically noiseless, odorless, and free from vibration." A simple lever engaged the drive mechanism and applied the brake and with the mere press of a button, you could increase and hold speed up to 30 mph. This was the same car Winton drove at the breakneck speed of nearly 34 mph, the one which Winton and his shop superintendent William A. "Bert" Hatcher believed in enough to make a daring nine-day trip from Cleveland to New York City. Actual driving time was calculated at 78 hours and 43 minutes and refueling was accomplished via gasoline (or cleaning fluid) purchases at hardware stores along the way. In 1898, Winton sold 22 cars, including what is recognized as the first American-made, gasoline-powered, mass-produced car to Robert Allison Cole who appeared at the factory with $1000 cash in hand to buy the car he'd seen advertised. He was responding to an ad in Scientific American: "Dispense With a Horse and save the expense, care and anxiety of keeping it." The Winton Motor carriage, which could run at a cost of 1/2 cent per mile, was said to be "handsomely, strongly, and yet lightly constructed and elegantly finished". Winton was not in the business of making made-to-order vehicles but Mr. Cole was invited to choose from any of the four completed cars then on hand. (The car he chose has now made its way into the Smithsonian's automobile collection.) The twelfth such car went to James Ward Packard—but that one cost Winton money in the long run. During the 60-mile trip to his Warren, Ohio home, Packard's new Winton stopped running. A team of plow horses had to tow him home. Thereafter, as the story goes, Packard wrote letters of complaint and returned the car repeatedly for servicing. Winton, after he'd tried going to Packard's home to make peace, eventually invited the "smarty pants" to see if he could build a better car himself. Packard did just that, after helping himself to the financial backing of major Winton investor George Lewis Weiss and hiring away Winton's plant superintendent William A. Hatcher. In 1899, the first Packard was built. 1899 was another milestone year for Winton, too. In that year Winton created the first U.S. mail truck that Cleveland's Postmaster tested, directing it on a horse-drawn wagon route that took six hours to cover. The Winton did it in 2 hours, 27 minutes—in a snowstorm, no less. While it took a number of years for mail delivery vehicles to be seen in wide numbers, the U.S. Postmaster General was apprised of the favorable test, one also reported in The Horseless Age of December 20, 1899. In 1899, Winton's new factory superintendent Leo Malinowski asked earnest young mechanic Henry Ford to interview for employment — but Winton wasn't sufficiently impressed with his skills to hire him. Ford had already built his first motor car by then but it wouldn't be until 1903 that he incorporated the Ford Motor Company. Early that year Dr. R. V. Pierce of Buffalo, famed creator and salesman of patent medicines like "Smart Weed" and "Pleasant Pellets", bought six Winton delivery wagons to keep sales brisk. Vanderbilt brothers —Reginald and Alfred— purchased 8-hp Wintons, as well, but theirs were for use at their swank Newport, Rhode Island summer homes. Another purchaser that year was wealthy socialite Larz Anderson, one-time U. S. Ambassador to Japan—and you can still see that car at the Larz Anderson Auto Museum in Brookline, Massachusetts. As Winton searched for ways to distribute his cars, he hit upon some early solutions that still pertain today. The first auto dealership, representing Winton cars, opened in Reading, Pennsylvania. And Winton built the first auto hauler—with the shortened wheelbase of a touring car, it could pull a car loaded onto a small semi-trailer and situated part-way over the cab. While Winton was one of the first manufacturers to create a tight production schedule, it still took a long time to produce cars. By turning to advertising and creating news stories about his product, he managed to increase customer demand, leading to significant increases in production numbers, sales prices, and profit. To boost interest and sales, Winton hit on the idea of a repeat durability test—again from Cleveland to New York—but the difference this time was that this test was sponsored by the Cleveland Plain Dealer. In May, reporter Charles B. Shanks joined Winton and filed daily news stories along the way. Readers of more than thirty papers followed along as they covered more than 700 miles over 5 days; total driving time was 47 hours, 34 minutes, shaving about 40% off the earlier time. They used less than five gallons of water and twenty-one gallons of gas. When they reached their destination, they had a letter from the mayor of Cleveland to new York city's mayor—but more important by far, nearly a million people greeted them and had a closer look at their motor carriage, one which Shanks had christened with the French name "automobile". Sales boomed, prices increased, and Winton hired Shanks as his Advertising Manager. J. J. Henry Sturmey, founder of British publication The Autocar, reported on the Winton in his October 28, 1899 issue. He called the 6-hp single cylinder Winton "substantially built, exceedingly easy to ride in, and well calculated to stand the rough work of American roads." Winton told Sturmey that he was producing cars in lots of 25, and at the close of the 1899 year, 100 Wintons had been built, establishing the firm as the largest gas-powered car manufacturer of the time. So, what did the 1899 Winton offer the motoring public? A two-seater measured 104 inches long and sat on an incredibly small wheelbase of 69 inches. It started with a hand crank, had a two-speed transmission, and was steered with a tiller connected to the front wheels. The gas tank held three gallons. A driver had to remember to check that oil, too, since the oil was dripped onto the transmission, engine, and differential, all essential components for keeping the car running. Winton continued with automotive innovations in 1900. First to use a steering wheel rather than a tiller, and first to build a special racer to enter international racing events, starting with the Gordon Bennett Cup Race in France, he also saw the need to add a business-wagon department to his factory. But the year brought its troubles, as well. Pursuing its Selden patent, The Electric Vehicle Company went after the big guy for patent infringement, claiming Winton had to license from them to continue building his gas-powered engines. Winton's factory was probably the largest in the world at that time and he made an inviting target. His defense team demurred to the suit, admitting the facts were true but saying they did not entitle Electric Vehicle to prevail. Rather, they claimed, the suit should be dismissed. Two years later and many dollars poorer, Winton was considering settlement. Winton did invest $25 for a 90-day option to build Winton cars under the Selden patent but he never exercised that option. Instead, a number of other manufacturers joined with Winton, formed the Manufacturers Mutual Association (later named the Association of Licensed Automobile Manufacturers), and negotiated much, much lower royalty payments and control of the patent's legal and licensing rights. Despite the Selden patent distraction, sales were up and Winton still had enough heart to continue publicizing his car. With reporter Shanks, he attempted a cross-country drive, beginning in San Francisco on May 20. Eleven days later, however, when their car got stuck in the desert sands of Nevada, their trip ended prematurely. Not to be undone by that failure, Winton continued to race, setting speed records, and entering an October 10-mile race at the Detroit Driving Club in Grosse Pointe, Michiganâ€”against the enterprising 38-year old Henry Ford. Before a crowd of 8,000, Winton had to drop out of the race at the 8-mile mark because of mechanical difficulties. Showing he had no hard feelings toward Ford, though, Winton gave him a steering mechanism, saying the one Ford was using was bound to kill somebody. And just after the race, Winton vowed to try again and began work on his bullet racer, one which set a new world speed record of 70 mph. Winton continued investing in advertising his car, as well, claiming that "the best guarantee of the future is the experience of the past". 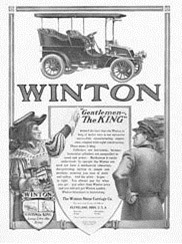 One ad called the Winton a "strong favorite" with those who could appreciate the value of "high-grade workmanship, best materials, beautiful finish, and all that assists in the composition of a high-grade, practical automobile". Sales were brisk enough by 1902 for Winton to start construction of his own factory and separate sales office and garage, increasing staff to 1500 workers. There were Winton branches in New York, Chicago, Boston, and Philadelphia and the Winton held claim to being the most reliable car on the market. Part of its reliability might have been attributable to the development of the first practical storage battery. Early batteries consisted of a box to hold carbon-made cups filled with battery acid. So Winton asked one of his staff, a Mr. P.P. Nungesser, to build something better. When, after a series of experiments, Nungesser admitted defeat, Winton recommended using copper wire gauze instead since the copper was flexible and would not deteriorate from the acid. The copper idea worked well for a good many years and led Nungesser to establish his own battery company. Winton continued racing his Bullet, as well, and was the first to drive a mile under one minute. The 57-hp Bullet had a 492 cubic-inch four-cylinder engine and set a number of unofficial world speed records, reaching speeds up to 70 mph. Just over a year after his defeat by Ford, Winton was ready to try again. Victory, however, still eluded him. Ford had hired Barney Oldfield to race his "Old 999" and while Winton braked to go around the curves, Oldfield accelerated and just slid around them. After four punishing laps, the Winton broke down. Figuring if you can't lick 'em, join 'em, Winton hired Oldfield as his race driver soon thereafter. Thirty-one year old Dr. Horatio Nelson Jackson of Burlington, Vermont was vacationing in San Francisco in the spring of 1903 when, playing cards at the exclusive University Club, someone dared him to try crossing the country by car. With Yankee stubbornness, Jackson bet $50 he could do just that—in ninety days. His first order of business was checking with his wealthy wife that she would bankroll his venture. Finding her agreeable, he then set about finding an able mechanic. Sewall Crocker fit the bill and Crocker recommended traveling in a sturdy, reliable Winton touring car. Winton's San Francisco agent, however, had no cars in stock. Jackson eventually found a Winton owner, a banker at Wells Fargo, ready to part with his slightly-used Winton for a considerable profit. The car, which Jackson named "Vermont", was a 2-cylinder, water-cooled 20 hp car with chain drive and a top speed of 30 mph but lacked a roof or windshield. The wooden-bodied car that held ten gallons of gas was painted "Winton red" and trimmed in black, with tufted leather seats. Jackson took out the back sear to make a place to stow his gear. Gathering supplies and summoning his courage, four days after placing his bet Jackson started on his 3,000+ mile journey—destination New York City. With only 150 miles of paved road coast to coast—all within city limits—and no gas stations or road maps, the journey through muck and mire required considerable pluck. Soon after starting out, Jackson acquired the bull terrier Bud as trip mascot, fitted him with goggles and let him ride alongside the co-drivers. Climbing mountains, fording streams, and answering questions from curious crowds along the way, Jackson and his cross country quest became headline news. "Vermont" overcame the roughest road conditions and on July 20 reached Cleveland where Shanks had arranged for Winton's top managers and a huge crowd to greet it. At Cleveland's Hotel Hollenden, Winton threw a banquet in Jackson's honor and offered to have plant mechanics check the car, an offer which Jackson refused, fearing it would jeopardize his amateur standing. What a boost Horatio's Drive gave the Winton Company but 1903 brought other triumphs, as well. The Winton Bullet No. 2, with America's first straight eight-cylinder horizontal engine (two four-cylinder engines bolted together), weighed 3,400 pounds and produced more than 80 hp. It broke several speed records and won that year's Gordon Bennett Trophy. The success of the Winton had made its founder a wealthy man but one still hoping to expand his market. That he did by a continued reliance on improvements to the car and on advertising. In 1904, his Bullet 2, raced by Barney Oldfield at Daytona Beach, set a new speed record of 83.7 mph. Other drivers—Earl H. Kiser and Charles Gorndt—drove Bullet No. 2 and Bullet No. 3 on successive race days in late August in Cleveland—and set a new world speed record. Winton's sales brochure proclaimed: "Winton is King. It Wears the Crown of Excellence." It extolled the August world speed record, noting that neither driver had ever before been at the wheel of a Winton, and assured readers that "Anybody can drive the Winton successfully because it is easily operated, fast, powerful, durable". Another ad featured a man in medieval garb with the Winton seal on his tabard, holding a miniature steering wheel in his right gloved hand and addressing a garage man wearing coveralls and a cap. The text of the ad read: "Gentlemen—the King. Behind the fact that the Winton is king of motor cars is our extensive automobile manufacturing experience, coupled with tight construction. These make it king. Cylinders are horizontal, because horizontal cylinders are unequalled in speed and power. Mechanism is easily understood: to operate the Winton one need not have a mechanical education. Air-governing system is simple and absolute, assuring you ease of mind and safety. Price is right." The 1904 20-hp Touring car sat five passengers and was selling for $2500 fully equipped or $2300 without the top. Word was certainly getting around. Winton leased a special Pullman car to bring members of the press to Cleveland to tour the Winton factory. And in October, 1904, Winton himself met Andrew Carnegie's chauffeur who had been dispatched to drive Carnegie's new 24-hp limousine back to his Fifth Avenue mansion—really special delivery service. Expanding sales enabled new branches to pop up; by 1905, these were situated in New York, London, Toronto, and Honolulu. They were selling new models, too, inclusive of delivery wagons and racing cars. Whether it was a Noiseless Model K or a Model A Limousine, ads claimed that these cars were "graceful as a Greyhound, but as strong as steel can make [them]." 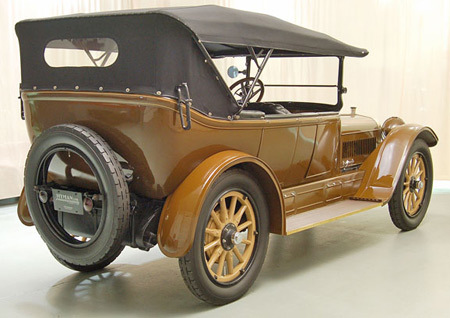 The 1905 models shaved 800 pounds off the '04 versions and also enabled drivers to remove the whole transmission gear, which was located underneath the floorboard in front of the seat, without the bother of removing the seat first or scrambling underneath the car. Winton was also bent on shoring up its parts suppliers. While Winton Motor co. first bought stock in the Cleveland Cap Screw co. (manufacturer of long-threaded bolts with heads electrically welded to the shafts and, later, engine valve stems) in 1903, it acquired majority interest in that firm in 1905, with Alexander Winton as President. A 1906 Winton ad for a self-starting, 30 hp model, depicted a liveried chauffeur driving men and women in evening attire. In a pitch to the swank set, the ad copy noted that while many cars got to their owners 99% complete, it was that missing one per cent that could cause "the disability of the remaining 99 per cent for most of the [social] season." The Winton was now a badge for the rich as much as a durable, reliable mode of transportation. In 1907, Winton sold 1100 cars, introducing the first Six-cylinder car as well as sliding gear transmissions with three and four speeds. In fact, after that year the Six was all Winton would build. Automobile demand exceeded supply so a number of car manufacturers sprang up, not all of them scrupulous about the finished product. As a 1907 Winton ad had it, "Manufacturers are tempted to rush cars onto the market for speedy sale—a bad thing for them and their buyers, because Quality can't be rushed. Better to make a hundred cars RIGHT and retain the confidence of a hundred buyers than to get the money for a thousand "rushed" cars." Winton, with years of experience in the market, insisted on turning out a quality product and was careful to claim credit for it. The Ford Model T had its start in 1908. 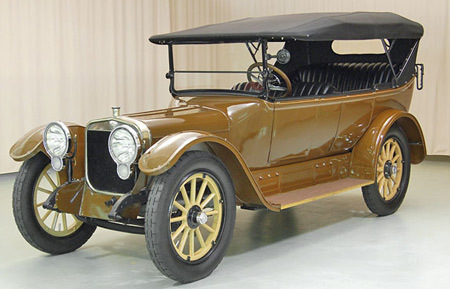 Only produced in black, its initial cost was $850—and more than 15 million Model T's would roll off the assembly line. Still, the Six was Winton's calling card and the company urged drivers to give it a try: "Find Out What a Six Can do and You'll Not be Contented Until You Have One". Ohio-born President William Taft, in office from 1909 to 1913, was the first President to own and drive cars. He established a fleet of cars for the white House that included a Baker Electric, a White Model M Steam Car, a Pierce Arrow, and several Wintons. The Six really was Winton's claim to fame during these years, and a 1909 ad claimed that Winton had been forced to make and market them two years ahead of schedule. Ad copy explained further that the 1907 Model M four-cylinder had "no superior among fours" but "finding buyers clamoring for a new merit that fours could not satisfy, Mr. Winton had no alternative." He just had to give customers what they wanted, and when that was extra power, Winton perfected the Six. By 1910, Winton had marketed eighteen models and had learned as much about marketing as about manufacturing cars. Marketing campaigns let customers know that the Winton Six exhausted the present possibilities of motor car perfection; that it had the only air-powered, self-cranking starter motor [Note: the compressed air starter could also be used to inflate tires]; and that it was made by a specialist. Such campaigns also quoted satisfied customers, one California lady saying, "It accomplishes previously impossible results in quietness, comfort, flexibility, hill-climbing and economy." Quoting from an article that appeared in Collier's Weekly, a Winton ad noted that the Six was "so quiet that the occupants of the tonneau have to talk in whispers to keep the chauffeur from hearing". The hyperbole in ads of the time didn't pass Winton by, either. One ad extolling the charm of the Six had this to say: "The charm of a superb motor car cannot be described; like the odor of exquisite perfume, it can never be known until it is personally experienced. Charm is that harmonious excellence which wins without argument. To the car owner who feels its influence, it has a value beyond price, and he would not trade that car for any other car in the wide, wide world." Other ad copy hit a similar tone: "The automobile is no longer an experiment. It is the acme of comfort, the emolument of prosperity, and the largest manufacturer of envy in existence." By 1911, Winton had set about assisting customers in new ways, issuing a catalogue with "Twelve Rules to Help Buyers" that also explained the difference between value and price. The "smooth as velvet" Six sat on a 114-inch wheelbase, had a 48 hp motor, and sold for $3,000. Repair costs were low, averaging 43 cents per 1000 miles. Winton literature noted that "Purchasers Buy From Choice, But Competitors Follow From Necessity" and that buyer satisfaction was paramount: "Behind the beautiful appearance and performance of the Winton Six is something else—of equal of greater importance. That is the buyer's satisfaction." Winton couldn't resist a jab at failed competitors, either, saying it had a list of 32 makers whose Sixes "went wrong" and dropped from the market. Whether competitors made Winton feel edgy or he had a simple desire to try another business, in 1912, he returned to earlier interests and formed the Winton Gas Engine and Manufacturing Co. to produce marine engines. A year later the company produced America's first diesel engine. Besides that innovation, however, the founding of the company proved fortuitous in that, though his car company ceased production in 1924, Winton's engine business continued to prosper. When he was ready to retire in 1930, he sold his going concern to GM. In 1913, the company must have been feeling the pinch of lower-priced cars—like Fords. While a Ford cost a customer a little more than $300, some Wintons were selling for ten times that. Questioning whether its customers really wanted a downscale, less expensive car, Winton reached out to them with advertising: "Big Output or Big Merit? We could easily quadruple our output by selling a six-cylinder car around $2500. But it would be a gross violation of confidence. To sell a Six at $2500, it would be necessary for us to cut down quality to skimp on workmanship, or, worse still, to assemble parts from other facilities, instead of building the complete car ourselves. There are a thousand ways to cheapen a car, and every one of them, in our case, would be dishonest." That sales pitch may have been persuasive initially since Winton enjoyed one of its best sales years ever in 1914 when it switched to left-hand drive. Winton harped on its longevity in the automotive field and on the beauty of its Winton Six, "The American Beauty: [Winton,] The first company in America to manufacture a marketable motor car of any type (1898) and the first in the world to manufacture six-cylinder cars exclusively (1909), has so thoroly [sic] developed the Winton Six that today this car is the one outstanding exemplar of wholesome American beauty and merit." With a thumb of the nose to other lesser car makers, Winton continued taking bows in another ad: "Where To Look For Merit. Alexander Winton makes the Winton Six. He does not make any other car. No other car embodies his experience. Mr. Winton founded the gasoline motor car industry in America. He is the world's most experienced specialist in six-cylinder cars. That's why it is unfair to any other car to expect it to show merit equal to Winton Six merit." A driver did get a lot of extras with the Six, including a 3250 long stoke motor, left-hand drive, electric lights, a self-starter, the finest mohair top, a rain-vision glass front, a full set of tools, and a German silver (an alloy consisting primarily of copper, nickel and zinc with a color resembling silver-white) radiator. The following year, the company reorganized as the Winton Motor Car Co. and produced 2,450 cars. Because dealers had persisted in convincing Winton to drop the idea of his compressed-air starter in favor of an electric one, those cars came with an electric starter option. Each of those cars, the company assured, had a "refreshing beauty . . . in marked contrast to the monotonous similarity found in cars of conventional design." The dig at Ford and other low-priced car makers was plain. By contrast, the claim was that the Winton had "distinctive character . . . varied in each separate car to meet the tests of the owner and his family." One of the new models that owner might select was the Six Model 21, smaller (with a 128 rather than a 138 inch wheelbase) and less expensive. Still stressing high-priced quality in 1916, one Winton ad relegated mass-produced cars to the ordinariness of a ferry boat: "Most automobiles are mere utilitiesâ€”like ferry boats. They are built to carry passengers and they lack fine qualities that go to make life delightful—beautifully balanced proportion, pleasant color harmonies, smart leathers and fabrics, and thoro [sic] provision for bodily comfort. These essentials belong not to ferry boats, but to private yachts; not to ordinary automobiles, but to the personal cars of real individuals." Harping on the idea of look-alike, characterless cars dotting the landscape, Winton offered drivers an alternative: "Streets are filled with cars of monotonous similarity. Many an owner identifies his own car by checking up the license number. Traffic is a double stream of ordinary blacks and greens. At rare intervals, in cheerful contrast the dull monotony is relieved by a distinctly individual car. Its owner has chosen a "different" design: its harmonious colors reflect excellent personal taste. Passersby take note. They turn for a second longing look. For they are human beings and they love the beautiful . . . . Winton six cars are built for men and women whose taste demands the genuinely good things of life." In making sure such men and women of taste were cared for, Winton produced 2,458 cars that year. The U.S. entered WWI in 1917 and Winton was heavily involved in military production. A post-War ad explained how Winton had contributed to America's winning effort: "Never a Delay. The automobiles used by United States Army Generals over there were closed cars, many of them Winton Six limousines: and the work they performed under the severest tests—weather of every sort, war-worn and shell-ripped roads, practically continuous running, without lights at night—is the best proof that the closed car is much more than a distinguished social vehicle." But the 1917 Winton rolling down the streets of America was definitely a high-class car. A large, powerful, comfortable car, it was a match for all others. Besides its refined finish, it now had a handsome, grained dashboard with Warner speedometer and Waltham clock. Still, those extra features kept prices high, some above $4,000. In an ad for the 1918 Winton, the company did its best to make customers feel better about such a large investment, comparing it to the purchase of a new home: "Treasured sentiments and memories cluster about the old home, and yet—The new home represents new ideals, new hopes, the fulfillment of years of planning, expectations realized. It suggests a honeymoon, or the renewal of a honeymoon long past. It starts a fresh chapter in the book of our lives. . . sentiments and memories cluster about one's faithful old motor car, too. Yet the old car can't go on forever, and the superior new one, like the new home, carries with it new ideals, new hopes, and a freshness that gives life a delightful zest." As the War ended, Americans were looking to put dark days behind them. Winton, in good economic shape because of its involvement in the War effort, advertised a "Smart and Graceful" Six with "Magnificent Charming witchery of style . . . alive with power, correct to the smallest detail and refreshingly restful." It also offered its clients something new and even better than the older Wintons: "Seeing this car, you will know that yesterday's cars are surpassed, that here are new thrills, new enjoyments, new happiness awaiting you. Beauty that captivates, power and speed that laugh at miles and hardest hills, comfort and style beyond previous "bests," a mechanism that harmonizes with your needs and stays in tune—all these are yours in this newest Winton Six, the surprise car of 1919." Although the Wintons were still beautiful, there were a great number of new start-up car manufacturers and automotive innovations competing with them. And by 1920 America was beset by a post-War recession that spelled a decline in vehicle sales. By 1922, Winton was already beginning to experience financial woes and made only 690 cars that year. In 1923 there was an attempt to consolidate with troubled car manufacturers Haynes and Dorris but Winton dragged his feet and the consolidation never came about. That year alone nearly 50 U.S. auto firms folded. Winton tried to hold on but in early 1924 they liquidated, with only twelve completed cars left in their inventory. Winton is credited with having brought a good many innovations to early U.S. car production. His cars were well-powered beauties that helped ignite popular interest in motor cars not only as daily transport but as a way to connect with other towns and cities across the country. But in the end Winton could not compete effectively with Ford and his "people's car". Acknowledging the vital role he did play in the industry, however, in 2005, he was inducted into the Automotive Hall of Fame.